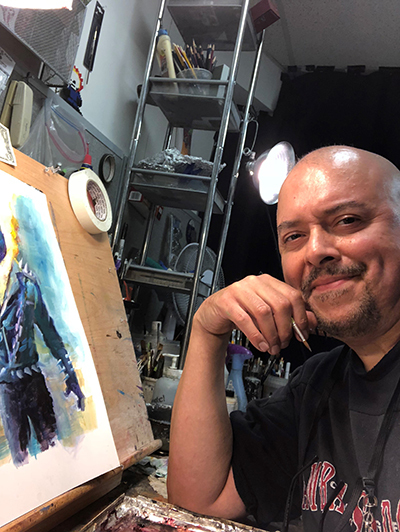 Though comic book artist Mark (“TEX”) Texeira is best known for his work on Ghost Rider, Black Panther, and Vampirella, his flair for visual storytelling spans across disciplines and media. For nearly 40 years, Texeira’s dynamic drawings have been featured in hundreds of books and comics, as well as record albums, magazines, and advertisements. Beloved by his legion of fans, Mark Texeira is welcome everywhere he goes. He gives each fan an autograph with a unique drawing, making a lasting impression with his charm and energy. His enthusiasm has no bounds, and he possesses a great sense of humor and an intense curiosity. His transparency expresses his respect and passion for his audience, his work, and his art. Texeira has earned movie credits for his work on Black Panther, Ghost Rider, and Jonah Hex. Currently, he is dedicating himself to 66 pages of illustrations for the book A Million Ways to Die, by Frank Terri and Mark Texeira, set to be released in the summer of 2018. Fans can also find his cherished work on the comic and collectibles website Dynamic Forces. Having studied at the High School of Art and Design in Manhattan and the School of Visual Arts, he began his career doing illustrations for He-Man and War Zone, followed by his work in DC Comics, where he illustrated titles such as Jonah Hex, Swamp Thing, and Stormwatch. Mark Texeira is famous for his astonishing oil paintings, his creative illustrations, and his talent for storytelling that takes you to new heights. With his New York Boricua heritage, his dynamic personality displays his optimism and enthusiasm for transforming thoughts into actions. Mark is an example for millions of fans because although he lived through moments of hard youth in the acclaimed city of New York, he continued his path by being persistent and committed to art. Like a tornado with limitless energy, Mark has conquered the world by being in comic conventions such as La Mole in Mexico City, Hawaii, France, and China, among others. His years of study with his mentors Max Ginsburg, Irwin Greenberg, and David Leffel, among others, are a testament to his oil painting abilities. Texeira's extensive run includes books, comics, and countless paintings shown in movies and more. With his influential and charismatic personality, he continues conquering the world of art. His philosophy motivates him to wander around the world in search of the meaning of life and capture it in his drawings. During his time with Marvel, Mark displayed his drawing talents in Psi-Force, Punisher War Journal, Ghost Rider, Legacy of Evil, Wolverine, Sabretooth, Spider-Man: Black Panther (Marvel Knights), Moon Knight, Hercules, Cyclops, Stalker, and more. Collectors can also enjoy Texeira’s illustrations in Upper Deck’s Marvel trading card series. For Image, he illustrated series like The Darkness: Wanted Dead, Tomb Raider: Scarface's Treasure, Thor, and Union # 1. Texeira is also known for his classic work with the characters Vampirella and Pantha for the former Harris Publications label.